For simple and elegant coding, C Programming introduced new technique called as Recursion in C. Recursion means a function calling itself. Let us consider a well know simple example called factorial to understand the recursion in C programming. In C programming, We can get the achieve the output in multiple ways such as using For Loop, While Loop etc. But if you observe the above pattern, it is repetitive behaviour which means recursive in C. So instead of writing the loops we can write the function using C recursion. Let us calculate for 5! In this article we will show you, How to write program using Recursion in C Programming with practical example. 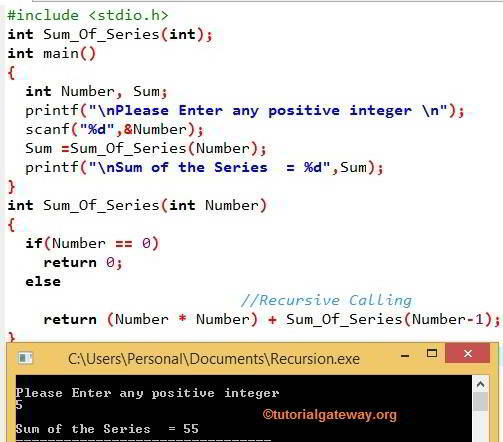 This Recursion in C program allows the user to enter the value of N then, it will find the sum of the above series using recursion. We declared 2 integer variables Number and Sum. Below printf statement will ask the user to enter any integer value. In the next line, we called the user defined function Sum_Of_Series() and assigned it to the integer variable Sum. When the compiler reaches the function calling then it will jump to the function definition for the calculations. NOTE: We must use some sort condition to exit the C recursive calling. If you forgot the condition then the function will execute infinite times.